So boring game between England and Paraguay in the World Cup, come read my blog better ler. 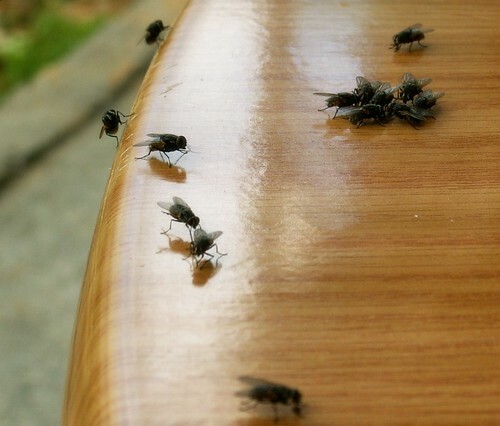 Watching football on TV is as interesting as watching these flies swarming on the table. Cheh! Let me tell you about stupid tourists story. Today is almost the end of the of school holidays which mean no more teachers bringing bus loads of jakun kids to almost every corner I go. No more jakuns jamming our roads. Just today, the whole Burmah Road was jammed because almost every out-of-towners must simply grab a packet of Tambun Biscuits before returning to their villages. Good riddance of pesky tourists! So, we went to this coffeeshop to have lunch and the placed is packed. There is this table with three guys and 2 women. Not Ah Lian and Ah Beng type but those studious, tse-pu-tse (yes/no/yes = Chinese eds), fair-fair, acne-ridden faced, those rectangulars spectacles type. They had finished their foods. My kids and I waited next to their table because they had farking cleaned every ice-cubes and every grain of rice. The coffeeshop taukeh-soh knows me because I had been patronising her place for like 20 years. So, she gave me a wicked grin and intentionally make some noises while removing the glasses. Anyone would have felt that their presence is not welcome anymore. We ordered our drinks and the taukeh-soh plonked them on the table. Two of my kids purposely squeeze and sit on the available chairs. Still no reaction from this bunch of teachers (heh, I am listening to their conversation mah). Then, dnmch, a lottery lady came and they took their sweet time to choose the lotteries, scratch to win and talk somemore. I mumbled to my kids. If our chicken rice is here, I am going to take out the camera and snapped a photo of these bunch of hillbillies and post them on my blog. They are lucky our chicken rice took a mighty long time to arrive or else, I sure humour them wan. And that blardy, inconsiderate, think their 5 cents bigger than bullock cart wheel bunch finally went off after they got too uncomfortable because my atm was standing akimbo, breathing down their necks behind them. Hope they have a major lausai today while they are driving back to whatever village they came from. May they poo-ed in their pants. Eat in coffeeshop somemore want to sit like in cafe. Coffeeshop owners and hawkers need customers to earn money, not providing your country bumpkin butts a chair to sit on till they grow roots. 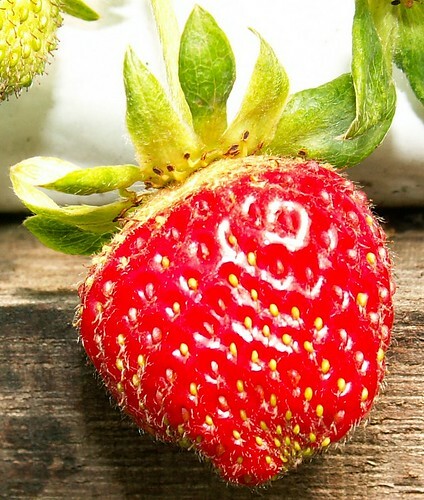 Ok, ok, after all the worms and flies pics, here is a strawberry to sweeten your mouth. And England vs. Paraguay is a big yawn. Previous Previous post: Just 5 minutes before the World Cup kick-off..
You’re right, the match is a bore. Those people at the coffee shop are really one kind ya. Should take their pic. watching football is boring! full stop! but hor..u got lots of pet flies wor! Interesting blog:) Wicked sense of humour! You know. I found the flies a lot more interesting than the world cup.